Texas Deaf/Hard of Hearing Services is a statewide project to provide technical assistance and professional development to staff serving DHH students. Learning happens anytime we reflect on something we have experienced. That experience could be a formal professional development workshop we have participated in, or it could be a quote we heard or read, a video we watched, or book we read. 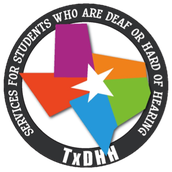 The TxDHH Learning Bites addresses a topic relevant to deaf educators by providing resources in various sized bites! Whether you have 1, 5, or 15 minutes, or you choose to dig much deeper, you will find resources to help make an impact on you and your students. 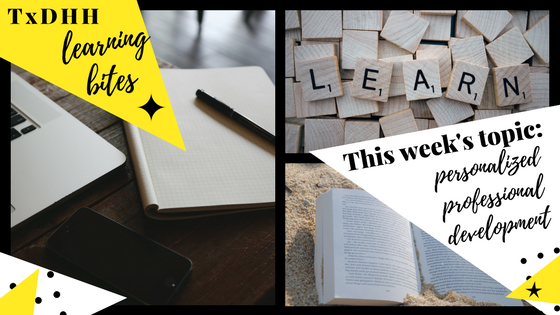 Below are four different learning opportunities on the weekly topic, each requiring a different level of time commitment and involving different types of materials. Think about how you prefer to learn and how much time you want to commit. Then choose one (or more) of the activities or articles below. If you prefer a topic other than the weekly topic, we have included Mental Health Musings, Terp Topics, and Learning Tech Bytes for you to consider. When you complete your PD, follow the directions at the bottom of the Learning Bites Smore to apply for your Continuing Professional Education credits. 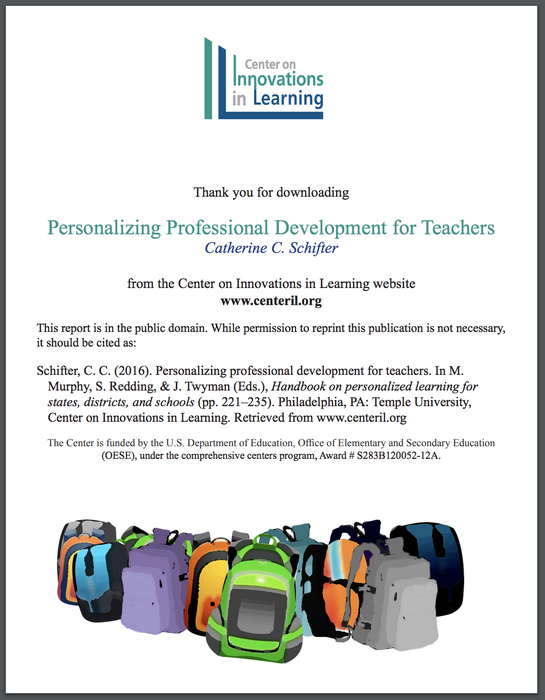 Often we are required to attend professional development that is "one size fits all," but it doesn't actually meet our personal and professional learning goals. We chose the topic of personalized professional development for our first TxDHH Learning Bite to help introduce the idea of PD that is different than the traditional formal PD we receive at school. 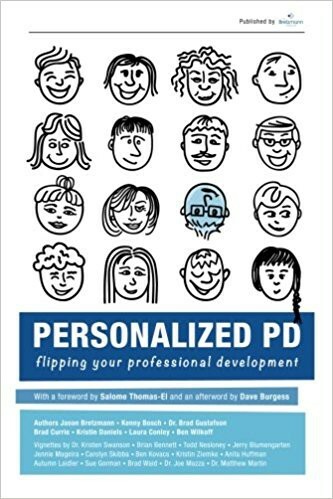 The PD you will experience over the next several months is informal, comes in a variety of formats, and includes various topics for you to choose from. Read the quote below. What does it mean to you? Think about what it says as you answer the reflection questions in the google form. You can read the entire Manifesto at ProfessionallyDriven.com. Prefer to Read a Blog? 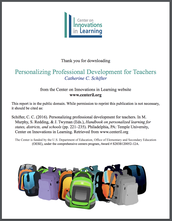 What should professional development look like? Can all teachers get exactly what they need? How do we energize every individual to realize their full potential? 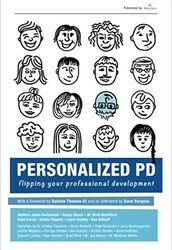 Personalized PD: Flipping Your Professional Development helps answer these questions and more. 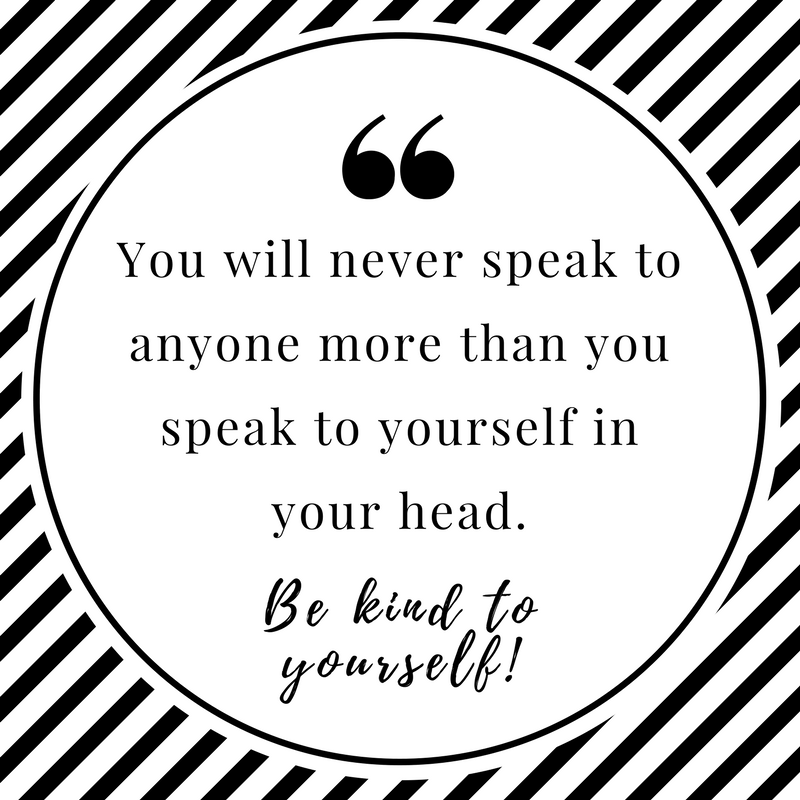 "You will never speak to anyone as much as you speak to yourself in your head." What does this mean to us as educators? 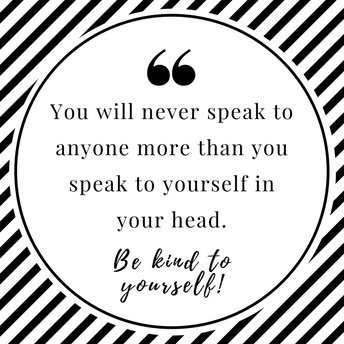 Are we tearing ourselves down from the inside, or building ourselves up? What are we modeling for our students? 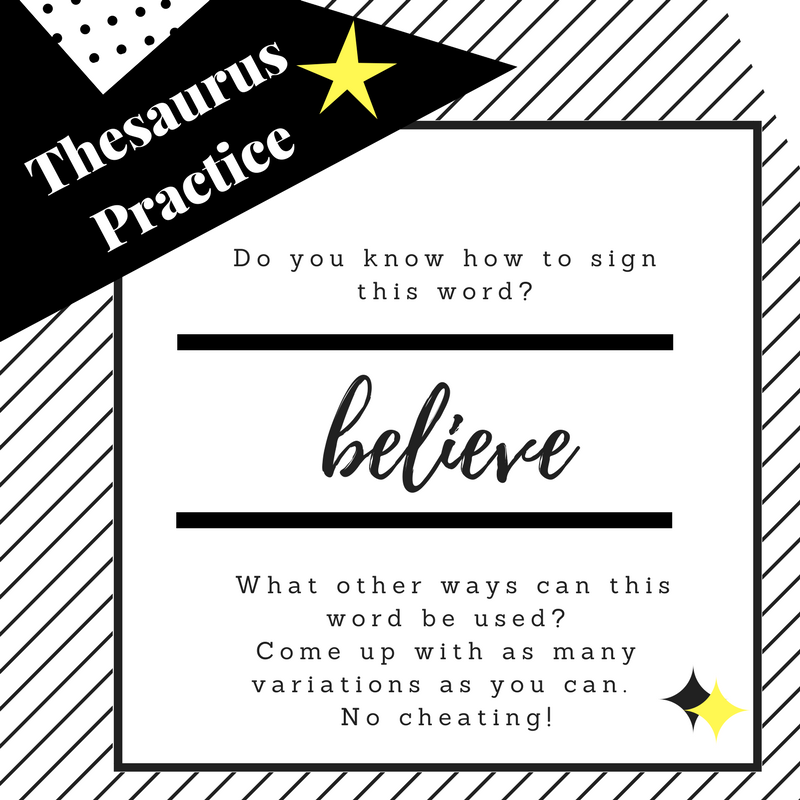 Using the word “believe,” come up with as many variations as possible from your head. No cheating! Below is a link to the group Voice Thread. Watch the video with the instructions, then add your video before viewing everyone else's. Do you struggle to find current event articles that are age appropriate, yet written at a level your students can read? Maybe you have found articles some of your students can read, but they are too easy or difficult for others. 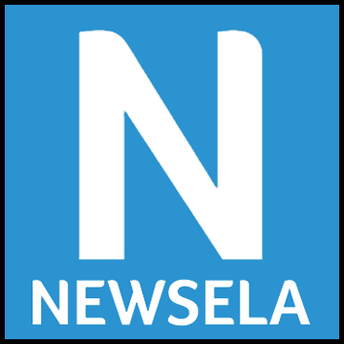 Newsela is a site with current event stories from various news sources, adapted to five different reading levels. Teachers create free accounts, create classes, assign articles at the appropriate level, and enjoy having differentiated materials already available! What does this look like in action for me? For any learning experience, our learning is equal to our effort. In order for us to grow from our learning, we need to take the time to pause and reflect. 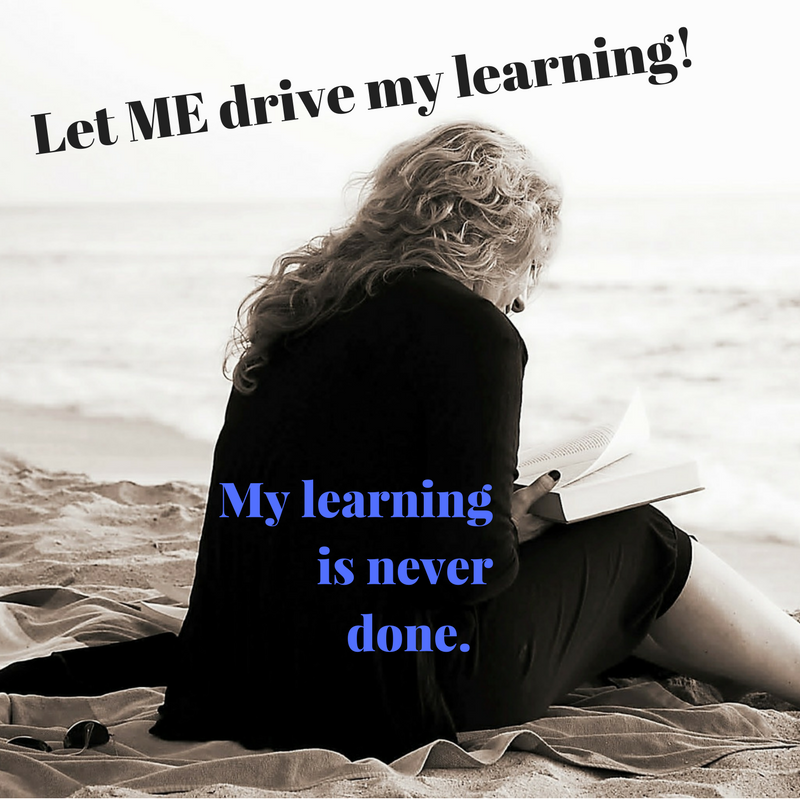 How does our new learning fit in to what we already know and do? Each of you reading this has a different role, with different responsibilities. Think about what you learned today through the lens of your particular role, as well as your personal and professional learning needs. This is an important part of the learning process! Take the time to think about a new idea you learned, a new approach you want to try, or a new skill you have acquired. Consider how to put your new insights, skills, and abilities to work! That's where the real learning happens.